At TopRank Marketing, we believe integration makes the digital marketing world go round, bringing balance and harmony to your digital marketing efforts. To help you weave your paid search and SEO tactics together, we asked TopRank Marketing’s own search marketing philosophers, Joe Manier and Steve Slater, to share their advice and insights. Since we’re being philosophical and metaphorical, paid search and SEO are the pizza and beer pairing of digital marketing. They’re both awesome in their own right, but in coming together, they give you a more satisfying meal. With “search” in the name of both tactics, you might already have an indication of why they make such a great pair. But in case you didn’t know, Joe and Steve give their reasons why they complement each other so well. “SEO and paid search are two ways of coming at the same goal of getting clicks from searchers you care about,” is how Joe explains it. For example, both tactics aim to earn high visibility in search results for target keywords. In order to reach that goal however, they utilize different strategies and techniques, allowing you to cover more ground in search results. “SEO is not a promotional strategy. When you need to get eyeballs to a webpage, SEO can take time and the results come slowly. But when you turn on a paid search campaign, you instantly get traffic to your web page. Using the two together leads to instant impact and long-term results,” Steve says. Not only do paid search and SEO go after similar goals, but they do it in two different ways, opening up the possibility of increasing your results exponentially. To bring the two tactics together and get those high-flying results that Aristotle mentions, you need to use paid search to influence SEO and vice versa to create a truly synergistic relationship. To help you create that relationship, this is the advice that Joe and Steve have to offer. #1 – Use paid search to test your hypothesis. Because paid search is a way to “cheat” your way into a top ranking, you can actually glean a lot of insights from your search ads. Taking up the top four spots, ads receive a lot of impressions on search engine results pages (SERPs), giving you valuable information on what attracts clicks or conversions and what doesn’t. “I use paid search as a testing method for what content resonates with searchers. After a campaign has run, I can see what messages led to higher click-through rates (CTR) with each of our target audiences. Then, I apply those insights to title tags and meta descriptions on high impression keywords or pages to boost organic CTR,” Joe says. And by naming your campaigns strategically, you can immediately see what types of messaging perform well. For example, Joe has found success with solution-based ad messages, earning a great number of clicks and conversions. Knowing this, he can then insert more solution-based messages into organic meta content to try and replicate those same results. Using the same principle, paid search could be a faster method for A/B testing any meta description or title tag changes as it doesn’t require that you actually update your website. #2 – Take stock of conversions and the competition. Paid search campaign data isn’t only good for meta content, it’s also great for assessing the keywords you want to target. “If you want to know exactly what keywords lead to a conversion, you can run a paid search campaign and pretty easily start to fill in the blanks,” Steve explains. In this scenario, you can look at the results of your paid campaign in Google AdWords (see below) to determine which keyword bids led to conversions. Those top converting keywords can then serve as focus areas for your SEO efforts. In addition, AdWords data can help you identify which keywords are more difficult to go after. If you notice that a target keyword has a high average cost per click (CPC), it’s safe to assume that there’s a lot of competition driving the bids up. Given this information, you may want to adjust your optimization efforts towards lower-difficulty keywords that you have a better chance of ranking for. #3 – Form your paid strategy based on current rankings. We’ve shared how paid can influence your SEO strategy, but what about the other way around? Well, if you have a keyword glossary, Joe likes to use it to divvy up which keywords are ideal for SEO and which are better to go after with paid search. “I like to combine newly finished keyword research with ranking reports from the get-go as it gives instant visibility into how we’re doing organically. Then, I sort the keywords based on if they’d be a better fit for SEO (such as long-tail question keywords) or paid search (keywords where we stand little chance of seeing organic wins in the near-term),” Joe offers. In analyzing the different type of keywords you rank for, you can more easily identify keywords you should bid on in your paid search campaigns. If you’re hoping to improve those organic rankings, however, you shouldn’t rely on your paid campaigns to move the needle. “One thing you should not expect when it comes to running paid search and SEO together is even better rankings. Turning on paid search is not going to improve organic rankings,” Steve warns. To improve organic rankings, it’s best to stick to alternative methods like on-page optimization around target keywords, internal cross-linking, or additional content. #4 – Adopt an SEO philosophy when structuring paid search campaigns. Using an SEO mindset when structuring a paid search campaign is another method that can be very beneficial. For example, tapping into SEO knowledge can help you earn higher quality scores for your AdWords campaigns. “The quality score largely determines how a keyword performs in your AdWords campaign. The quality score is calculated by factoring in expected CTR, ad relevance, and landing page experience. When you think like an SEO it’s pretty easy to break these elements down. “As an SEO, you understand how bots interpret a page and search intent, helping you craft relevant ad copy and an easy-to-use landing page experience that increases CTR and your quality score,” Steve says. According to Google, ads with “higher quality scores typically lead to lower costs and better ad positions.” Increasing your score means optimizing your ads for increased visibility and clicks while lowering your CPC. Aristotle was onto something all the way back in ~330 BC and his advice is still relevant today. While paid search and SEO can stand on their own and increase your search marketing results, if they’re paired together correctly, they can increase your CTR, boost impressions, and expand your keyword umbrella even further. But that’s not the only opportunity for you to integrate your marketing strategies to drive incredible results. Find out how social media and SEO make an unlikely, yet beneficial pairing. 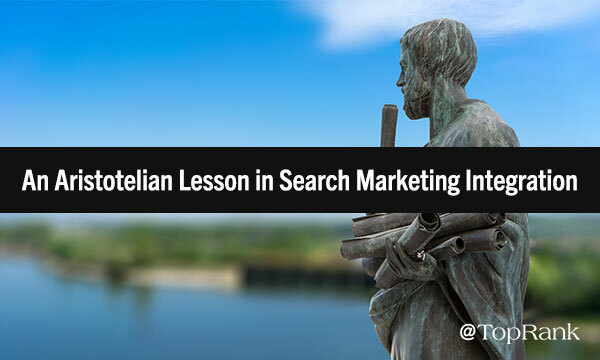 The post SEO + Paid Search: An Aristotelian Lesson in Search Marketing Integration appeared first on Online Marketing Blog – TopRank®.